An attractive piece of classic Art Nouveau bedroom furniture. This beautiful and elegantly finished late Victorian art nouveau red walnut wardrobe features twin mirrored doors and decoratively carved door to centre. It is an unusual piece as it is all hanging space to the top section, and still retains its original pleated lining. This sits upon two large deep and useful drawers. This art nouveau red walnut wardrobe still retains all of its original handles and is in lovely condition for its age. The item will break down into four individual pieces for ease of transportation and reassembly. 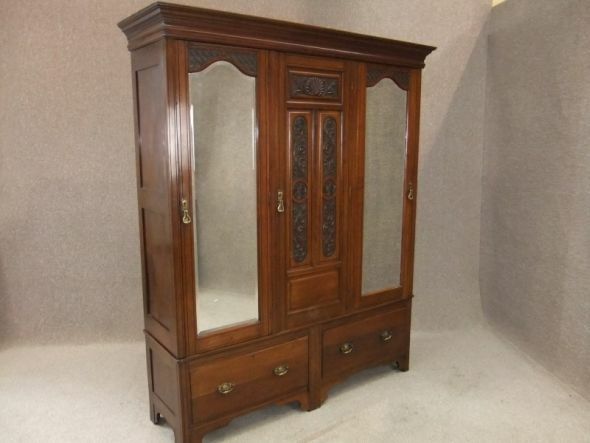 An ideal piece of bedroom furniture to grace any period bedroom interior.